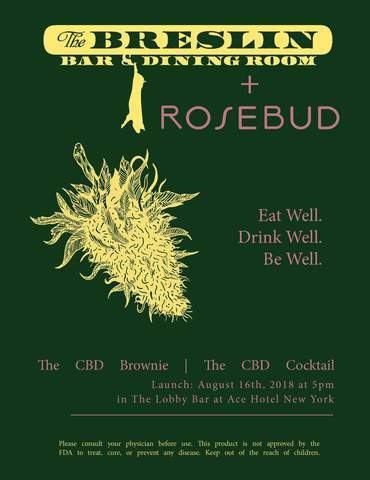 Rosebud CBD at the Ace Hotel New York // August 16th! The cocktail, coined “The Rosebud,” is an 8 mg CBD-infused fruity blend of Pommeau, grapefruit sauvage, italicus bergamot, and fresh grapefruit juice, shaken & strained over kold draft ice in a Collins glass. The brownie is a decadent, gluten-free treat containing 12 mg of Rosebud CBD oil and rich Valrhona chocolate. RSVP here to meet us at The Lobby Bar at the Ace Hotel New York (20 W 29th St, New York, NY 10001) at 5 pm. DJ Miss Milan will be gracing the decks until 8 pm! We can’t wait to meet you!